Shared data within a students portfolio can be accessed in PupilPath by both the parent and student. 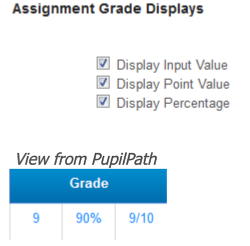 Classroom provides a "Grade Output" feature in which we can manipulate the grade data shown on PupilPath. "Grade Outputs" also allows you to manage mobile notifications to the PupilPath app on iPhones, iPads, iPods and Android devices. Hiding Report Card Scores in PupilPath until a specific date is also an available option. Go to the Settings tab and choose Grade Outputs. 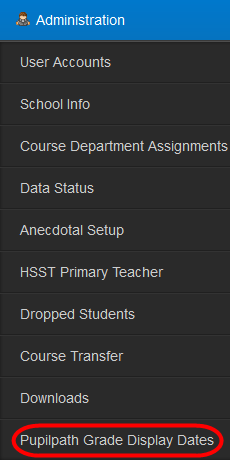 Choose a course from the Select A Course dropdown menu to modify the Grade Outputs. 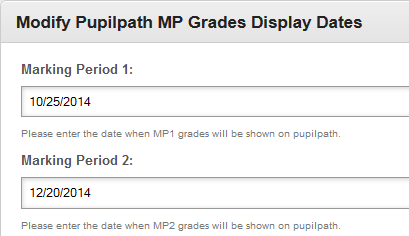 The options under the Assignment Grade Displays heading control which grades/scores display in PupilPath. Check off the scores your want to display. Input Value is the first column shown in PupilPath. This value displays whatever the teacher has entered as a score. For example, if the teachers enters an A, the input value is displayed as an A. Percentage is the second column shown. This value shows the percentage score for the grade. For example, if this assignment is worth 10 points and the student scores a 9, the percentage displayed is 90%. Point Value is the third and final column. This value shows points achieved/points possible. For example, if the student scored nine points on a 10 point assignment, the value displayed is 9/10. Adjust the way averages display in PupilPath using the settings found under the Average Displays heading. By default, the marking period average will display as a Raw percentage. You can use the dropdown menu to display the score as a range. Conversions from a Grading Template can also be configured by checking that option. Classroom can push notifications to PupilPath users who have signed up. These notifications are sent to iPhones, iPods, iPads, and all Android devices with the PupilPath app installed. Delay Push Notification rules until "x" minutes have passed. Keep in mind if a teacher is grading late at night, users will be notified after the delay time. "Save Changes" at the bottom of the page. Naturally progress the user to the next step. Ready for more? Visit XYZ. Now that you have learned how to XYZ, learn how to (link to doc).